Hang on girlfriends! We are going to the beach to escape ministry life. I’ll be by to pick up anyone who is interested in joining me. We are going to ditch our troubles and sink our toes into the warm, white sands. We are going to let the breeze blow away the stress of life and allow the waves to sing to our souls. Don’t forget your sunscreen. Oh and don’t forget to toss in a bag of chocolate, because when girlfriends get together, calories don’t count. Ok, so maybe we aren’t heading to the beach but I really wish we could. I don’t know about you but it seems ministering to people is just getting harder every day. It seems our husbands spend more time doing administration than they do preparing for sermons. I also have found myself pulled in every direction possible. For the last two weekends, I have been at the church Friday, Saturday and Sunday preparing for and attending events plus attending meetings. The first weekend our women’s ministry team, which I am part of, hosted a salad lunch for our ladies. We had close to 200 women attend. It was great but it was a lot of work and preparation for our team. Then, last weekend the team hosted a reception following the memorial service for our pianist who had served faithfully for many years. Our church wanted to show its appreciation for her life and service. After church on Sunday evening, I collapsed into bed exhausted and told my husband that I resign from ministry. Well, we all know we can’t just resign unless God leads in that direction. I do wonder at times what life would be like. Would life be slower and calmer? Would we travel? Would we be bored sitting at home not doing ministry? Seriously, what would our lives be like if we weren’t following God’s call on our lives? I guess for now I will just dream of sitting in my beach chair on some gorgeous island. I will dream of no phone calls in the middle of the night, no meetings that last all Sunday afternoon, and no big events that take up my time on the weekends. I can dream of spending some quiet, unrushed time talking to the Lord. However, I can tell you this. After a few days of R & R, I am ready to be back doing what God has called us to do-loving the lost and leading them to the Savior. A couple of weeks ago I took my three-year-old grandson, Gideon, to his preschool. On the way, we stopped by a local park that has a beautiful lake. Gideon is fascinated with wildlife so we always go hunting for turtles, fish, and ducks. As we walked around the pond, Gideon squealed with delight when he spotted an aging turtle sunning himself on the banks. Of course, the turtle splashed back into the pond when he spied Gideon running up to it and me trying to catch Gideon before he jumped in after the turtle. Thankfully Gideon stopped just short of the pond, bent over, and watched the turtle swim around below him. As I reached the water’s edge, Gideon looked up and said, “Vivi, see all the fish swimming with Mr. Turtle?” Sure enough there were tiny fish gliding through the muddy water. Had I not looked closing I would have missed the scene. Later that morning I picked up Gideon’s brother, ten month old Jude, and we set out on our own adventure. I am introducing Jude to nature as well. Now for a ten month old, the world is pack full of “new” things. Birds tweeting, a breeze on your face, a dandelion, geese, and rocks all hold his attention. I am amazed every time I take Jude outdoors at what his little eyes and ears notice. I find myself paying closer attention as well. However, there is one point I want to make today. Sure, we should take time to notice our world around us but are we investing in our world. Our world tells that we should invest in the stock markets in order to have financial security. People put a portion of their salaries into IRAs or some other form of savings plan for the future. However, I believe we need to invest our time in relationships too. Right now my investment is in my time spent with my grandsons. We giggle together, give hugs and kisses, play and go on “ventures” and discover what God has given us. It is my hope that one day when they are grown that they will look back and remember that Vivi took time to love them and teach them about Jesus. As ministers’ wives we too need to invest in people. Yes, it is hard sometimes to build relationships with people in our church. They can hurt us. However, if we are truly called to ministry, we must spend time with people one on one. I have been in many relationships where I was “investing” my time and energy. Things seemed to really be progressing until a bump in the relationship occurs. BAM! There is a breech-harsh words, personal issues, mistrust, a move, etc. The relationship takes a hit and I must decide what to do. As for me, I try to discover ways to mend and rebuild. I hate broken relationships. They hurt my heart and cause me to question what I could do better. Just like when the stock market takes a hit and it takes time to recover and rebuild, the same is true in relationships. It may only take a couple of days and some forgiveness and the relationship is back on track. However, and sadly, sometimes broken relationships never mend. This has happened to me even though I have tried to restore the connection. Investments in ministry are sometimes very successful and at other times we must accept the fact that some investments never pay off. However, we must keep trying. We must keep investing our lives in to people around us. I think Jesus had some successes and some failures. I think of Peter who denied Jesus three times. Talk about a bump in that relationship investment. Yet, Jesus and Peter restored that connection and Peter became a great leader in Christianity. Then there is Judas who betrayed Jesus. Look at the time and energy Jesus poured into his life only to be disappointed. Judas used Jesus for his benefit. He gained thirty pieces of silver and lost eternity. What a waste! Ladies, I want to encourage to be intentional about making investments in people’s lives. Yes, there will be some failures, however, think about the eternal rewards for the successes. Earlier this week I wrote about reflections. One of the beautiful things that I can reflect on is that the Lord, in His graciousness and kindness, is allowing me another opportunity to go on a mission trip to share Christ with others. As I write, I am only two weeks away from traveling to Linstead, Jamaica to serve the Lord in sharing his Word, in sharing the love of Christ with others, and in encouraging any and every one that He allows to come across my path. This year I am excited that, from our church, there are three individuals going who have never been on a mission trip before. How awesome that they will get the opportunity to experience mission work in another country. I am excited for them and what the Lord will do in their lives! My sisters, please join me in praying that Christ will be exalted, honored, and gloried by all that He will have us to do in Jamaica. Please pray that the Lord will give us safe travel in the air and on the ground as we go on mission for Him. Also, please pray that many souls will come to saving faith in the Lord Jesus Christ! This is my fourth trip to Jamaica, and I am looking for the Lord to bless me as He has so faithfully done in the past. In my blog next month, Lord willing, I will share what the Lord did through our team (there are over 40 of us going!). To God Be the Glory for what He will do in Jamaica!!! This time of year is jammed pack with lots of school related activities: exams, end of the year parties and celebrations, trips, proms, promotions, and ending in greatly anticipated graduation ceremonies! In the midst of this frenzy of activity, students and parents have different reflections at year end. For the student, relief from months or years of studying, homework, tests, and putting up with teachers (some they like and some they don’t); yet also sadness from saying goodbye to friends and teammates, the “fun” extracurricular activities such as clubs and sports, and also, having to leave those teachers and administrators that really made a positive impact on their lives. For the parents, there is relief from making sure everyone gets out of the house on time, packing lunches, helping with homework, listening to kids whine about all the homework and all the tests, having to meet with teachers, (again, some you like, some you don’t), running here and there from dance class to sports practice to games to PTA meetings, etc. Also, for parents, there is a sense of sadness as, year after year, they watch their precious children get a little closer to young adulthood, to someday having them “leave the nest” for good. It all goes by in a flash; it’s hard to believe that my youngest daughter will be a sophomore in high school next year, and in three more years there is graduation and college. Where does the time go? By the time you read this blog, I will have already been to two graduations, and invited to others that I will not be able to attend because of scheduling conflicts. But end of year activities such as these cause me to reflect, on the past with its joys and sorrows, and also on the future, anticipating what is to come. Reflections are good as we ponder the things and events of the past. As I reflect, it can also lead to meditation. And meditation can lead to getting God’s perspective on the various situations in our lives. This past Sunday, my husband preached a message on meditating on the Lord, His Word, His creation, and His wonders. It makes you think: How often do we really stop and think about the awesomeness and vastness of our God, truly reflecting on who His is and how He intricately oversees all the events of our lives to the most minute detail, even knowing the number of hairs on our head! What a marvelous thought that we have a Savior who cares so deeply about us and loves us so passionately that He gave up His very life so that we could come to know Him and have intimate fellowship with Him throughout all eternity! We will never plumb the depths of all that God is, but it’s good to stop and think about what a great Father we have, what a loving Savior we serve. So as we get a little reflective at this time of year, as we see our kids, family, and friends transition from one season of life to another, may we use this time as a reminder to reflect on the One who….”is before all things, and in HIM [emphasis mine] all things hold together.” Colossians 1:17. Dwight Moody once said that out of 100 men, only one will read the Bible.......the other 99 will read a person. I can promise you that at least one person is WATCHING YOU. Your job is to make sure the your life "COUNTS" and is not a hindrance in leading others to His kingdom. How can we do that? By Spending Time with Jesus. When we spend time with HIM, it draws us closer to Him and does not allow room for Satan to tear us apart. How can we spend time with Him? Daily Quiet Time. Spending time in SCRIPTURES and in PRAYER. Daily Devotions, whether a Book Study, or Chapter-to-Chapter Study or 365 Daily Devos. Journals - written and pictures. However YOU choose to do it.......make it a Priority to SPEND TIME WITH JESUS! Make Your Witness Count.........YOU are someone's ONLY Bible. "Cry.....I spank you and put you in corner." My grandchildren are 3 years old and 2 years old. Already....at this young age, their personalities shine. They are complete opposites. We took them out on the boat fishing. Cameron, our grandson was busy throwing his rod and reel into the water and reeling it in. Kinley, our granddaughter was sitting in my lap playing. She would pretend "spank" me just to get a reaction. I would pretend to cry and she would laugh. After a few minutes of this playing, she "spanked" me again and Cameron saw it. He laid his rod and reel down and walked down the steps to me, where he rubbed my arm, kissed it and told Kinley, "Don't you hit Mimi again." Then Kinley reached and "spanked" me again. When I pretended to cry, she looked at me and said, "Cry and I spank you and put you in corner." Different as daylight and dark. One has a "you made your bed so now lay in it" attitude. I know that as a teacher and as a pastor's wife, I SHOULD be a Cameron and be compassionate and console people. But, in all honesty, there are days that although I attempt to be a "Cameron" my heart is truly longing to be a Kinley and just tell them what I really think. Do you ever want to just be a "Kinley"? Am I the ONLY one? God has convicted Roger and I and two other couples and led us to begin the GiveHim Project. I would like to share this with you so that you can be PRAYING. Our prayers are that Project GiveHIM Tennessee will spread throughout this state to raise awareness that Christians must realize the urgency of spreading the Gospel and begin reaching souls for Jesus Christ, or thousands of precious people will die and spend eternity in hell. 100% of all profits will go towards promoting this awareness and reaching the lost through community revivals, etc. Tennessee is currently growing at a rate of 50,000 people per year. Tennessee also has approximately 3.5 million lost people in our state, people who have no affiliation with any Church in our great state. In order to reach the lost, we as Tennessee Baptists will need to reach over 50,000 persons per year just to keep up with our growth rate. 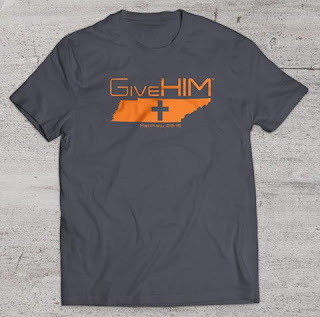 The goal of Project GiveHIM Tennessee is to raise awareness that we as Baptists in Tennessee have a monumental task before us in reaching lost souls for Jesus. The GiveHim™ Project is a call to action for Christians to turn their homes, communities, cities, counties, and states over to Jesus. We have come to the conclusion that God calls our first mission field to be our homes, then grow out from there. Our goal is to bring revival to our lives and the world through community outreach. The first step in this project is GiveHim™ Tennessee. Our initial goals are to see 2,500 lives saved, 10 community revivals, and 20 churches revitalized all across the state of Tennessee. We will host our first community revival in Rockwood, TN on June 10-12. If you are interested in joining us in this endeavor, or hosting a revival in your community, please contact us so you can join the movement! Tee Shirts may be ordered by going to the website. ALL of the money goes to help make these revivals possible. I have decided that God has a sense of humor!! Standing up in front of a group of women and speaking is WAY out of my comfort zone!! Two other times, God and I had a heart to heart talk about my comfort zone and I lost. Well, this year at our Bi-Vocational Couples Retreat, I was asked to go to a church in middle Tennessee and lead a Ladies Conference. WAAAAYYYYY out of MY Comfort Zone!!!! Without going into great detail, I did talk with God about it, but did not argue because when I do, I am the one that comes out a loser. My first time asked to step out of my comfort zone was to lead a session at our retreat a year ago. A few months before the date, God and I had a heart to heart talk while I was picking beans in the garden. I told him that I understood that he wanted me out of my comfort zone, but couldn't He have at least allowed me to speak a topic of my choice the first time??? Well....guess what????? January 2015 - I lead a session at the Bi-Vo Retreat....the topic they gave me.... "How to Find Your Mate's Love Language". Mother's Day Weekend, I led a two day Ladies Conference for an association. The conference theme was "A Mary Heart in a Martha World." Now, I know that most of you women are very comfortable with public speaking engagements. That is your calling. IT IS NOT MY CALLING..........and I AM VERY UNCOMFORTABLE with it. I CAN'T DO IT......GOD HAS TO. With the theme of the Ladies Conference last weekend.....I said either God had a sense of humor or he chose me to be the speaker because he wanted someone that was LIVING RIGHT IN THE MIDDLE OF THE MARTHA WORLD............. I'm there! Most days I don't know whether I'm coming or going. CONFESSION: One thing I have noticed.....when God places me out of my comfort zone....I have to TOTALLY lean on and trust HIM. Maybe that is why God likes to pull us out of our comfort zones every once in a while. As long as we are doing our passions and doing what comes natural.........WE CAN.....and we become guilty of doing it alone....without relying on God as much as we should. You never know when God will just jerk you right out of your comfort zone and sit back and watch how you handle it! Mother's Day is a great day set aside for us to honor our Mothers. It is a wonderful day and joyful day for most people. However....we get so caught up in telling all of the mothers Happy Mother's Day.....that we forget to be sensitive to the ones that this is a holiday of hurt. How about the folks who grew up with an absent mother.....one that chose to leave and not be around? They never knew what the love of a mother was like. How about the young couples that are experiencing infertility? This is just a reminder of their dreams that have been taken away from them. How about the mothers who have had a child that they did not carry full term or a child that has for some reason gone on to be with the Lord? How about the ones whose mothers have gone on to be with the Lord and they are missing them dearly? It is wonderful to honor our Mother's on Mother's Day.....but we need to stop and be sensitive to others. "He is good. He is near. He is faithful. He sees me. I am His. He's writing story, I'm just in the middle." God has a PLAN for your life....and it may not exactly be the plan you had yourself. One of our daughter's good friends posted on Facebook yesterday about the fact that she had always felt a calling to be a mother. After months passed and years passed, she could not help but get discouraged, hurt and broken. BUT...then God placed in her path several couples that had adopted. To make a long story short....they began the adoption process and adopted a new born straight from the hospital. Their son is almost two and has been the blessing they had waited so long for. Her calling was RIGHT; she was suppose to be a Mom. Her plans were to conceive..........God's plan was to adopt. At our church, we give each mother a red rose on Mother's Day. After they get their roses........then we give roses to ALL of the FEMALES in the church. We honor the ones who have never had their own biological children......because they have been like a mother to many. And we honor all of the females, regardless of age because one day they, too will either be a mother or be a "mother figure" to some lucky person. I have always tried to be sensitive to the hurt at Mother's Day...............but especially ever since our daughter and son-in-law experienced over two years of infertility. The hurt it real. AND....without meaning to cause more hurt, well meaning folks will many times come up to those couples and ask, "so....when are you going to have children?" BUT....in the process, we need to make sure we are sensitive to "others". I don't miss too many meals. I might like to "blame" low blood sugar, but if I am totally honest, most of the time I am ready to eat. I like to anticipate what I will get to eat -whether it is a holiday, a night at a favorite restaurant, or even a family meal gathered around the table at home. Italian, Mexican, Asian - the type of cuisine is really inconsequential. I can easily be in the mood for anything. But right now, I would have to say that my go-to food is the potato. French fried, baked, mashed, shredded into hash browns, or tater tots, it does not matter. Cravings? I like salsa and chips, but I LOVE candy. Like Vickie, I love me some chocolate, the darker the better- but I also really go for anything SOUR . . .
My body is pretty good at making sure I eat. Dieting is not something that has ever come easy to me and, as I enter my 40s this summer, I know I should take it a little more seriously. It isn't about food, but it is all about self-discipline and what I take in . . .
Over the three weeks or so, I have not been feasting on God's word like I should. I slowly pushed away from the table and have not even been nibbling on the Bread of Life. At first it wasn't a big deal. I had plenty of truth stored away for a rainy day to keep me going and, as a result, I really didn't notice much of a difference. I went on teaching my Sunday School class, leading the weekday preschool, and being able say all the right things that people needed to hear. However, the lack of spiritual truth to gnaw on slowly took its toll. I found myself missing the joy and feeling the discouragement. I tried to pass the blame onto my husband and daughters for my discontentment and resentment. I couldn't even begin to put my finger on what had happened to leave me feeling so inadequate and frustrated with myself. Then this week, through the revival at church, and the prayers of my husband, once I finally was honest enough to tell him something was going on, the Holy Spirit, gently said, "Come back. Read my word. Spend time with me. Really pray." But, I make time to do what I want to do. I make time to do what is important. I make time to do the things that NEED to be done. Somehow, I had lost my desire to spend time in God's word. My actions proved that I was making other things more important. I no longer looked at my Bible study and prayer time as something that NEEDED to be done. I want to hunger and thirst for righteousness the way I look forward to eating a juicy, medium-rare, ribeye with a loaded, baked potato and side salad with ranch dressing. I want to have the attitude that says I "get" to spend time in the word instead of I "have" to. And even on the days I don't "feel" like it, knowing I need to, that I still do it anyway, like when you make yourself open and fix that can of Campbell's Chicken Noodle Soup when you've got a cold and don't feel like eating. You know you need it, so you do it anyway. No, I don't miss many meals and I look for reasons to snack all-day-long. But my prayer tonight is that I would approach my time with my God the same way. Just as my physical body wants and needs nourishment and sustenance and, let's be honest, sugary sweets - I want my spirit to crave and devour the meat of the Word in the same way. I need a steady diet of Bible study and prayer and praise, not only or just to be a good mom, a \loving wife and supportive ministry partner. I need it to a healthy believer. I've done more than taste. I know that He is beyond good. I just need to be intentional to continually partake. Thank you Lord for forgiveness. Thank you for new mercies everyday. Thank you for creating such yummy foods- literally and spiritually. Recently I had the privilege and opportunity to speak at a meeting for a group of moms with preschoolers. I was given the topic of Words and soon I became very convicted. The Bible says in Proverbs that the power of life and death is in our tongues. I quickly realized how I had been abusing this power. We all know how untrue the old adage about “sticks and stones” is, just as we also know too well how we have had our day made or ruined by the thoughtful or careless words of someone else. The Bible also says that our words are the overflow of our hearts. In other words, what flows from our mouth is a direct product of what is in our heart. Even if we are Christians and know that we’ve given our hearts to Christ, our tongues can still get us into trouble and we find ourselves wounding the ones we love the most, want the best for and never want to harm. Often it is the little people we live with that tend to highlight our verbal shortcomings as they mimic, repeat and copy our mannerisms, phrases and , uhm… catchphrases . . . In the New Testament, James tells us that only the perfect man can control his tongue, that it is a restless evil, full of deadly poison. So, since none of us is perfect , what hope do we have? As Christians we don't have to do it alone. The Holy Spirit within us gives us exactly what we need to do whatever it is God calls us to, including taming our tongue. Being a minster's wife is hard. Saying the right thing at the right time is hard. Not saying the wrong thing at any given time is nearly impossible. But through Him, we can do all things . . . That's in the Bible too. Because the supernatural power of the Holy Spirit is within me, I have access to THE greatest power we could ever ask for to do whatever it is that God asks to - including biting our tongue when necessary too. It's nearly 9:30 at night. We just got home..... from the church. None of my girls were in bed on time. There are lunches waiting to be packed and a diaper bag needing to be filled. There's a load of laundry needing to be moved from the washer to the dryer. One of the sweet minister's wives at our church felt led to organize the rest of the staff wives to pray. She texted and sought an available window for all of us to plan to meet regularly to lift one another up in prayer for ourselves, our marriages and our families. She soon found that there was no "good" time to gather. We were all too busy trying to balance our families, jobs, homes, and places of service. Someone of our group suggested a private Facebook group for just us. We all enthusiastically jumped in and have eagerly accepted the platform for us to post prayers, requests and encouragements for each other. The Sister mentioned above is providing the leadership and helping to guide our prayers. Well...... Our church is hosting an "Impact Conference," (aka a revival) this week. Our speaker is good. The people are responding. God is definitely moving. My prayer is for His perspective, protection and provision in even the smallest details like what's for dinner and that no one gets left anywhere. My prayer is that even as we run and go and do that we would still find time to be alone and prepare our hearts for personal worship so that God can revive our spirits too. I don't know about y'all but I'm trying really hard not to wish this week away, but to fully live it for His glory.... I hope I'm the only one feeling this way, but thought my honesty with how I'm feeling, might encourage someone else to know that they aren't the only one if they were feeling this way too.... Gals, we aren't alone! I thank God for each of you! So far, at least at our house, God IS answering my prayers. I just wanted to post this here too, to let you know that you are not alone either. Our God knows. And we have common struggles as minister's wives. Maybe you can't relate to my thoughts right now, but maybe you can. Sometimes it just helps to know that you aren't the only one.